GE-1 is owned by GE Americom and is a continuation of the old RCA/GE Satcom series. GE-1 has 24 C-band and 24 Ku-band transponders, and replaced Satcom K1. GE-1 was placed in a supersynchronous transfer orbit of 191 × 56495 km × 25.0 deg. GE 2 was launched on 30 Jan 1997. 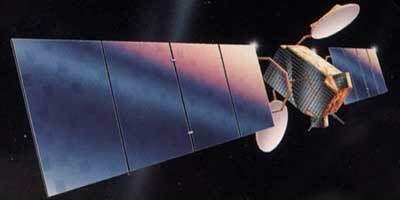 This is a C- and Ku-band spacecraft operated by GE Americom. It will replace Satcom K1 at 85° West. It has 24 C-band and 24 Ku-band transponders. GE 3 carries also 24 C-band and 24 Ku-band transponders to provide voice and video communications to North America after parking at 127° W longitude. GE 1, 2 and 3 have been renamed AMC 1, 2 and 3, when GE Americom was sold to SES. The A2100 satellites have a liquid apogee engine and electric arcjet thrusters. The aging AMC 3, being in inclined orbit, was acquired by Global Eagle in january 2017 and rebranded Eagle 1.